This year, 450 years since his birth, William Shakespeare will at last have the birthday cake he deserves. Shakespeare will be getting his cake and Stratford eating it as a giant birthday cake requiring the pulling power of a horse drawn carriage and decorated with the numbers ‘450’ is set to become the focal point of the celebration parade on Saturday, 26 April to mark Shakespeare’s 450th birthday. The town has come together to apply for a £10,550 grant from the Warwickshire County Council ‘Footfall Fund’ aimed at encouraging community groups to draw people into the county’s town centres. They have just received the good news that they have been awarded the full amount that’s needed for the project to go ahead. 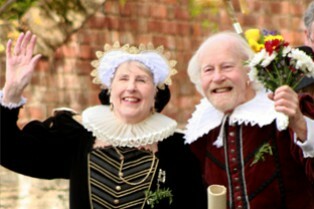 Shakespeare’s birthday celebrations provide an annual focal point for tens of thousands of visitors to the town every year and the Footfall Fund, part of a £400,000 ‘war chest’ aimed at boosting tourism under Warwickshire’s ‘Going For Growth’ initiative, will help Stratford further capitalise on the 450th anniversary of the Bard’s birth. Escape Community Arts will be working with their artist team to work with primary school age children and community groups from the Stratford District to design and decorate the model cake. Then on the big day, it will take a prominent role in the procession which has snaked its way through Stratford’s town centre to Shakespeare’s Grave at HolyTrinityChurch for more than 150 years. The cake will be escorted by a costumed character in the role of William Shakespeare from his Birthplace to ‘Handing over the Quill’ ceremony in Bridge Street. As part of the event, the head boy of KESGrammar School, where Shakespeare was a pupil, will not only receive a symbolic quill from ‘Shakespeare.’ The enormous ‘cake’ will be delivered with the quill and then paraded up and down Bridge Street before leading the Vicar of Stratford-upon-Avon, Reverend Patrick Taylor, and primary school pupils towards the HolytrinityChurch. Also this year, Stratford-upon-AvonCollege catering students will be showing off their baking skills at the end of the procession. Young procession participants and their families will be encouraged to return to Henley Street outside Shakespeare’s Birthplace to claim their free slice of another spectacular – but this time edible – 450th birthday cake. It is hoped that this will encourage them to stay in town a little longer to enjoy the plethora of entertainment and activities that are being organised by the Royal Shakespeare Theatre and Shakespeare Birthplace Trust. In addition, BID company, Stratforward, will be inviting town centre businesses to give away pieces of cake, supplied by a local bakery, and to show their participation in the scheme by displaying balloons in Shakespeare’s traditional black and gold. The aim of this is to make the most of the Celebrations by encouraging dwell time in the town centre and boost visitor revenues. Going forward, the model cake will be redecorated annually by community groups and become a focal point for future years, with the exception of 2016 when the town will come together to commemorate the 400th anniversary of Shakespeare’s death. The Bard was born and died on the same day – April 23 – St George’s Day. “All of these activities will serve to draw attention to the celebrations and the partnerships encouraging footfall through Stratford on this important weekend in the town’s tourist calendar,” said Val Harris, project manager, Shakespeare’s Birthday Celebrations, a new appointment by the Town and District Councils who is helping to generate additional interest in the 450th anniversary and make the Shakespeare Celebrations less reliant on public funding. “This year is an important year in the Shakespeare timeline – 450 years from his birth – and we want to make it a birthday to remember with increased footfall and even more reason for people to come and visit Stratford,” said Val.